Related: Read another word the Lord spoke to me about extreme pressure and breakthrough here. Is this word for you today? 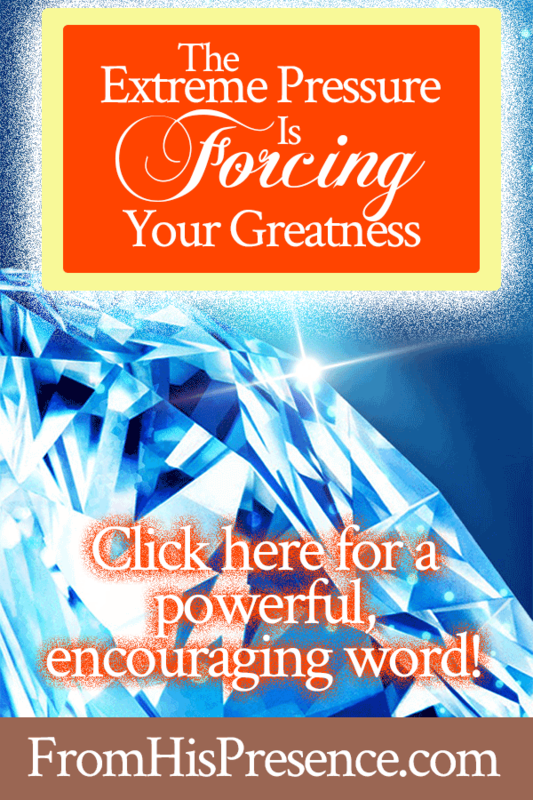 If so, please leave a comment below and share what this word means to you today! I have asked for many thing ,Bless the Lord God of Abraham. Yes it does with mine also, Blessed be thy name O LORD! WOW! is right!!! Thank you for coming to messenger to me. It is enlightening and comforting. I needed these words. I will continue to seek rest, renewal and respite through Jesus. GLORY GLORY GLORY to JESUS!! Spot on. The pressure feels more than I can bear, and I can’t. Thank you for bearing it with me Jesus. Dear Jamie, Bless you for your obedience. I was just singing in my heart that Im just an old chunck of coal, but Im going to be a diamond someday. The Lord has been trying to teach me moment by moment obediece. I want that with all my heart. Its my desire to live in His Shekinah Glory Presence. I love and pray for you Jamie. You ARE a diamond indeed, Teresa! Papa God is faithfully at work in you! “He who began a good work in you will be faithful to complete it until the day of Jesus Christ.” Hallelujah! Thank you Father God! Thank you Lord Jesus! Thank you Holy Spirit! In Jesus name AMEN. Yes, thank you, Jesus! I receive this word and your instruction to REST & TRUST! Thank you for your word and anointing of influence, Jesus! Thank you for promising to never leave nor forsake me! Thank you for being with me in this place! Amen and Amen and hallelujah!! Thank you for this Word. It has been such a loving reassuring word for such a time as this when everything around you appears to scream no one cares you will not make it another day because of this situation. And then I am reminded that even in my failure and flaws God has never left me and is still working his plan out in my life in spite of all my circumstances. Together for my good and his glory. His strength being made perfect in my weakness which ultimately gives me his perfect peace that passes all understanding. I love him for this and the true servant seekers of his heart. So very grateful for your faithfulness. ~a seeker of his heart. I definitely needed this word. Continue operating in the prophetic! Shalom. Thank you so much Lord!! I’m glad you know what you’re doing in my life and I don’t. I’m sure I’m not worthy of your calling for my life especially at the place I am now but I’m so thankful that I can see progress in some key areas. I would have never gotten where I am without You and I won’t get any further without You. Your grace is more than enough for me for your power is made absolutely perfect in all my weakness. There is no other like You! Thank you Jamie for sharing this prophecy. It has truly spoken to me! Thank you Jamie, l am truely blessed to belong to this community. l just imagine what l could have missed had l not been ushered into your ministry. l love what God is doing in my life right now, l have learnt not to be afraid to allow His WILL to be done in my life. For He is greater than my wishes. May our Father be glorified. l thank God for your opened Spiritual ears. May the hand of the Lord be on you and your family always. Wow–an on time Word. I’ve been feeling tremendous pressure, and ready to crack like an egg.–ready to throw in the towel. The easy way out was not the answer–I saw that. Frustrated that my life had taken on a turtle’s pace. Seems like heavens were shut against my prayers, my needs. I thank God for His Voice through you Jamie. So relevant at this moment in my life. I’m really encouraged knowing that God is by my side in each situation and I just need to rest and remain peaceful. Praise the Lord! Thank you Lord…this is an answer and comfort for a person who has been waiting on an answer for a seemingly long time… and it isTHIS answer…straight from the heart of God. Such comfort I am experiencing from these Godly, healthy words from our Lord. Thank you Jamie for saying “yes” to the Lord and creating this blog. God bless you real good! Thank you Jaime for this timely word. Its one of the Best I’ve received coming at the right time. I just read this this morning, and the timing could not have been more perfect. I was in great need of this reassurance and am so grateful! Thank You, Jamie, and thank You, Papa! I just read this post today, Palm Sunday. I am speechless and in tears. God has responded to ‘everything’. Praise God from whom ALL blessings come! Excellent Jamie, keep up the good work! I’m absolutely floored by your posts, especially today. It really helps me stay focused. May God continue to bring incredible increase in your Ministry as you reach others with your gifts for the purposes of His greater plans. Very on point. A definite confirmation. I feel Father Gods reassurance. I am overwhelmed! Amen. May the Lord bless your ministry Jamie.